Play Wooden Boy for a great chance to win some extra cash. Watch as Wooden Boy transitions from just a wood puppet into a real boy. This beautifully animated slot game will remind you of the popular tale that you remember from your childhood. This 5 reel game features 20 different lines. Players can get started for as little as one cent or as much as $100. When playing the Wooden Boy symbol can stand in for all other symbols except for the Blue Fairy who is the scatter symbol, with 3 of these you can play the bonus feature. This feature enables a multiplier which triples the win of any line. This game also features a random progressive jackpot meaning that you could win at any time. Whether or Not He is Real, His Money Sure Is Play Wooden Boy Now & Win Big! Wooden Boy is a fantasy-filed slot machine game where Pinocchio comes to life to award the most amazing prizes. Wooden Boy comes loaded with huge prizes, free game rounds and lots of fun! Wooden also offers a Free Game Feature and a Progressive Jackpot which is triggered totally at random. 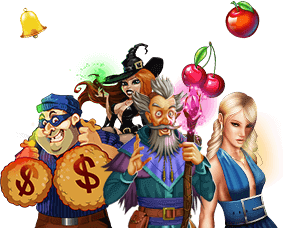 Come and experience the thrills of quick payouts and play Wooden Boy now! Wooden Boy is played at a maximum of 20 lines and a max bet per line of $5. Press the "Spin" button to get the reels spinning or simply go to the Autoplay feature to have the machine spin the reels for you. The "Wooden Boy" icon serves as a wild symbol substituting for any other in a winning combination except scattered "Fairies". Three or more scattered "Fairies" appearing anywhere will award 15 free games. Wooden Boy's Progressive Jackpot is triggered totally at random regardless of the amount wagered. Start playing Wooden Boy using the free version. Once you are acquainted with the game start playing with real money and placing low betting amounts. Only when you feel quite confident with the game start placing higher bets. Substitute: the substitute icon serves as a wild symbol substituting for any other symbol in a winning combination except scatters. Scatter: three or more scattered symbols appearing anywhere will trigger the Bonus Feature. Progressive Jackpot: the Progressive Jackpot is awarded completely at random.